Fayette County Special Olympics athletes visited the Fayette County Commissioners Office on Monday morning to sell them the first tickets to the annual Dwight Turner Memorial Spaghetti dinner at the Commission on Aging on March 24. Residents can now visit the Fayette County Board of DD, 1330 Robinson Road in Washington Court House, to purchase advance tickets for $5. Pictured (L to R): Fayette County Commissioner Jack DeWeese, Fayette County multi-sport Special Olympics athletes Kyler and Matthew, and Fayette County Commissioner Dan Dean. 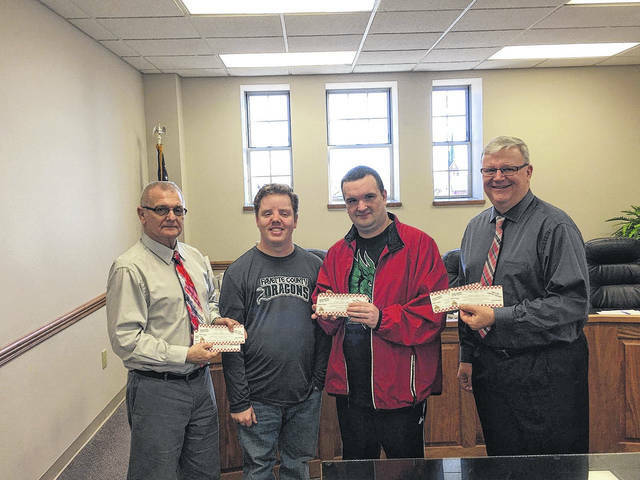 Fayette County Special Olympic athletes continued an annual tradition Monday of selling the first tickets for the annual Dwight Turner Memorial Spaghetti dinner to the Fayette County Commissioners. The Fayette County Board of Developmental Disabilities will host the dinner at the Commission on Aging on March 24. Each year, since the event’s inception, Tim Stewart, Community First Coordinator/Special Olympics Coordinator for the Fayette County Board of DD, said they have made a point to sell the first tickets to the commissioners. Dwight Turner was well-known within the community and was a great supporter of Fayette County Special Olympics up until the time of his passing. This year’s dinner will include spaghetti and meatballs, salad, bread stick, dessert and a drink. There will also be a silent auction/raffle at the dinner (you do not need to be present to win) and a 50/50 drawing. Tickets are now available with advance tickets available for $5. Tickets will be available at the door and are $6. Children 12 and under can eat for $3. Tickets can be purchased in advance by visiting the Fayette County Board of DD at 1330 Robinson Road. Additionally, the Fayette County Special Olympics fundraising games will return on March 21. This year’s fundraiser night will again feature two games. The first is the Fayette County Dragons JV team taking on “Team HAZMAT,”consisting of some local Hazmat first responders from Fayette County, starting at 5:30 p.m. The second game will be the varsity Dragons taking on the Guns and Hoses (local first responders) at roughly 7:30 p.m.
On the night of the fundraiser game, organizers will also be honoring Cheryl Binegar, a co-worker with the Fayette County Board of DD who was diagnosed with lung cancer recently. If interested in purchasing a shirt, contact Stewart at 740-335-7453 ext. 218 or stop in at the Fayette County Board of DD, Monday through Friday from 8 a.m. to 4 p.m. Proceeds of the t-shirt sale will benefit the Binegar family. Tim Stewart, Community First Coordinator/Special Olympics Coordinator for the Fayette County Board of DD, provided the information for the article. https://www.recordherald.com/wp-content/uploads/sites/27/2018/02/web1_IMG951116.jpgFayette County Special Olympics athletes visited the Fayette County Commissioners Office on Monday morning to sell them the first tickets to the annual Dwight Turner Memorial Spaghetti dinner at the Commission on Aging on March 24. Residents can now visit the Fayette County Board of DD, 1330 Robinson Road in Washington Court House, to purchase advance tickets for $5. Pictured (L to R): Fayette County Commissioner Jack DeWeese, Fayette County multi-sport Special Olympics athletes Kyler and Matthew, and Fayette County Commissioner Dan Dean.